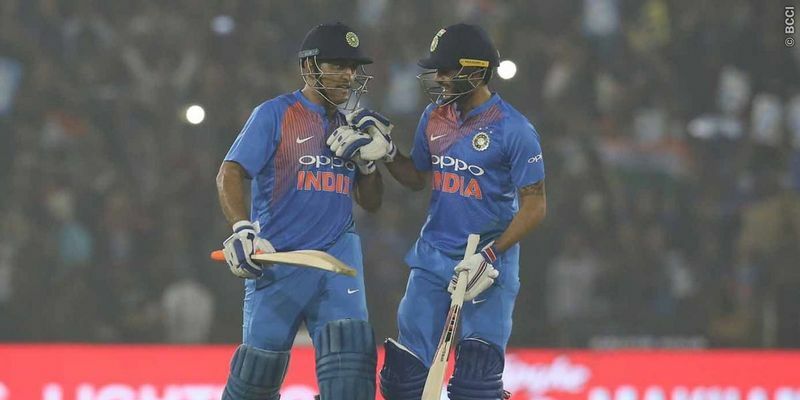 MS Dhoni had a field day in Cuttack as, after scoring an important 39 runs, he effected four dismissals behind the stumps to give India a 93-run win over the Lankans. The visitors could only manage a total of 87 runs in reply to India’s 180 and handed the hosts the initiative in the T20I series. Brief Scores : India 180/3 (KL Rahul 61, MS Dhoni 39*; Angelo Mathews 1/19, Thisara Perera 1/37) beat Sri Lanka 87/10 (Upul Tharanga 23; Kusal Perera 19; Yuzvendra Chahal 4/23, Hardik Pandya 3/29) by 93 runs. The writing on the wall was crystal clear - win the toss and bowl first, considering the impact that dew could have in the eastern part of India. So, after winning the toss, Thisara Perera, who decided to hand pacer Vishwa Fernando a debut, instantly asked India to bat first. Rohit Sharma, while revealing KL Rahul and Jaydev Unadkat had been promoted to the playing XI, admitted to being slightly disappointed about being “forced” to bat first. India started the innings on a good note and the two openers - Rohit and Rahul - stuck to their natural game and with the outfield being fast, they decided to play over the infield and made sure that the scorecard had a decent look in the first powerplay. But after playing some gorgeous drives and a brilliant sweep to get going, the Indian skipper, against the run of play, mistimed a shot while trying to take the aerial route over mid-on and ended up giving a catch to Dushmantha Chameera. However, that didn’t have any effect on India’s run-scoring rate as Shreyas Iyer, joining Rahul, easily found the gaps to help India reach 50 runs at the end of the powerplay. While the visitors struggled to get their rhythm right, Angelo Mathews was the only bowler who kept a nagging line and even trapped the opener, only to be turned down by the TV umpire. That, however, proved costly for the Lankans as Rahul, who suddenly found himself down the pecking order in the Test and ODI team, completed his second T20 half-century to guide India to 84/1 at the mid-way point of the innings. However, the run-scoring rate suddenly dipped and Nuwan Pradeep, along with Perera, managed to hit the deck hard and didn’t allow the duo any room to go for big ones. That also meant Iyer seemed susceptible and while trying to manufacture room for a cut, the Mumbaikar edged a Pradeep delivery to Niroshan Dickwella. Iyer’s dismissal made the crowd go berserk with MS Dhoni coming out to bat, and the former skipper didn’t disappoint, hitting a gorgeous straight drive to make his intentions clear. However, Rahul was castled by Perera in the 15th over when India were on 112 making things a bit more complicated. While Hardik Pandya would have been the perfect option to come at No. 5 due to his ability to hit clean, Manish Pandey surprisingly came out and entertained the crowd by finding boundaries at ease while rotating the strike brilliantly as well. But with 148 runs in 18 overs on the board, the duo needed to unleash their attacking self and Pandey took the initiative. Dhoni later joined him as they milked 20 runs in the penultimate over and the latter then hit a six in the last ball of the innings made sure that the hosts had a total of 180 runs to defend. Pandya was handed the new ball in the absence of Bhuvneshwar and was precise in his line and length before a fielding mishap cost him five runs on the last ball of the over. Coming to bowl the second over, there was a lot of pressure on the comeback man Jaydev Unadkat, but that suddenly disappeared on only the third ball of the over as Dickwella gave Rahul an easy catch at extra cover. The visitors’ approach to the game was really shambolic, to say the least, and it seemed they were giving the Indian team catching practice ahead of the South Africa tour. Upul Tharanga got out while trying to sweeping a Chahal leg-break, leaving the team with 39/2 in five overs. Run-scoring became very difficult for the Lankan team, but question mark came on their intent to play as Mathews, their senior statesman, played directly to the hands of Chahal before Gunaratne was being stumped by Dhoni. With the scorecard reading 57/4 after 10 overs, Sri Lanka’s hopes of a win was nothing but gone, and it was only a matter of time, India would register their first T20I victory at the venue. The floodgates had already open and it seemed like it was a race among the visitors’ batsmen to see who would have the dinner first. Kuldeep Yadav helped them in the same by accounting for Dasun Shanaka, who gave an easy catch to Pandya at long-on before Dhoni decided to effect yet another stumping to send Thisara packing. Kusal Perera, who seemed to have forgotten that he was playing the shortest format, and not the traditional one, was picked up by Kuldeep as well. With 71/7 in 13 overs, Sri Lanka had accepted their fate and India had wrapped up proceedings in the 16th over to take a 1-0 lead in the series. The victory also helped India forget the bad memories of 2015 Cuttack T20I in which the match had to be stopped twice as all hell broke loose as plastic bottles, hurled by the fans, found their way to the ground over the cordoned fence. India have now taken a lead in the three-match series as the caravan now makes it way to Indore (December 22) and Mumbai (December 24).